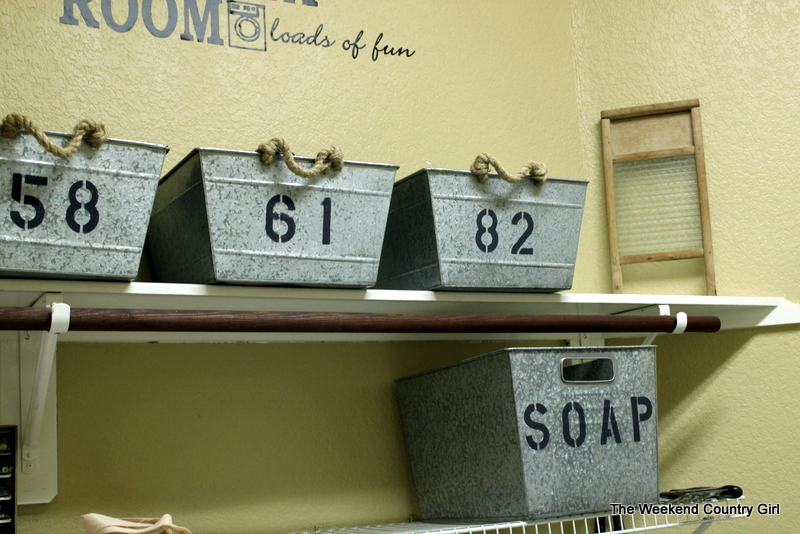 When we moved into our new house there were three things I liked about our laundry room. 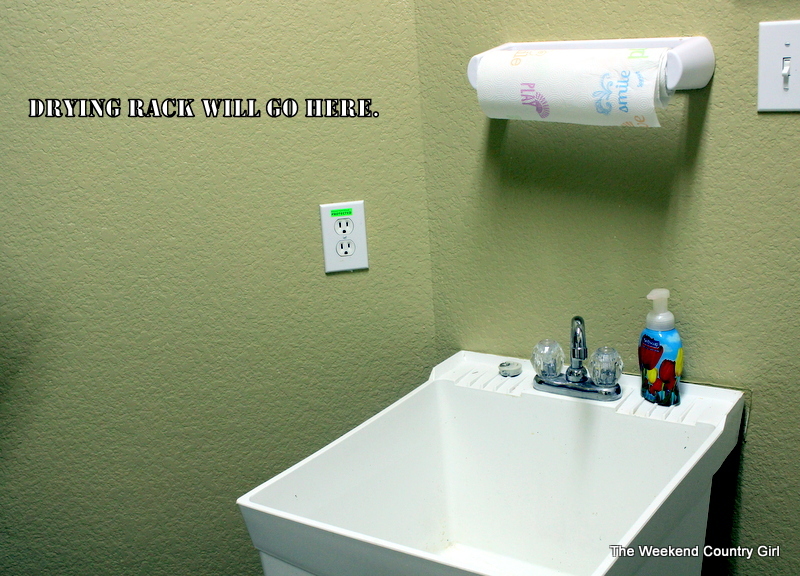 There was a sink in the laundry room! Never had that before. I liked this graphic on the wall. Nothing else. It needed love. The former home owners left all the paint that they had used on the house (thank you so very much- we are thrilled that we have touch up paint and know what colors were used!) We had just used it as a dumping ground and created a mess as we moved in. 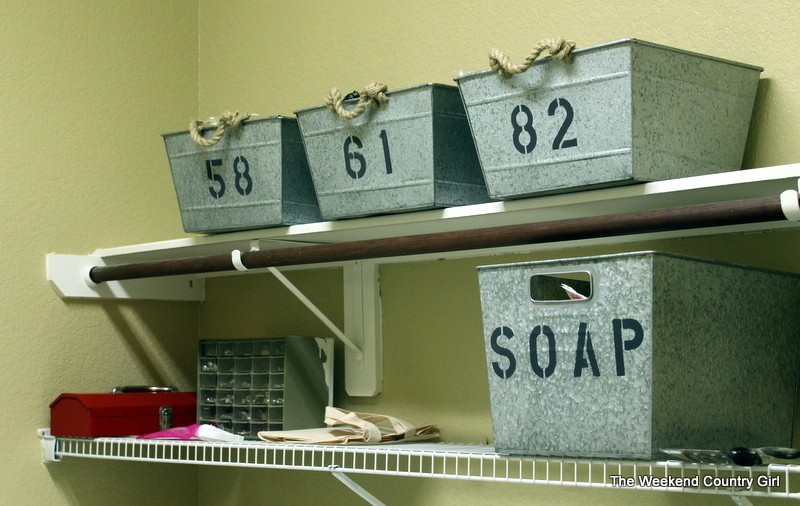 I have seen some amazing transformations of laundry rooms on Pinterest. I love them. I like seeing the chandeliers, soft colors, pretty boxes, crystal containers and granite counter tops. 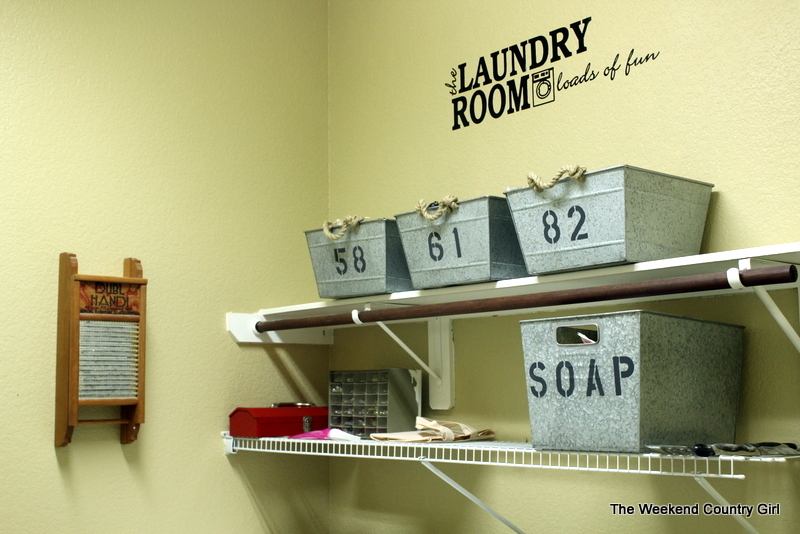 The problem I have with those laundry rooms is that they seem to say- in my opinion only- that the laundry room is the woman’s domain. Somehow cleaning clothes is a feminine activity alone. We both wear clothes, we both get them dirty, and we both wash clothes. 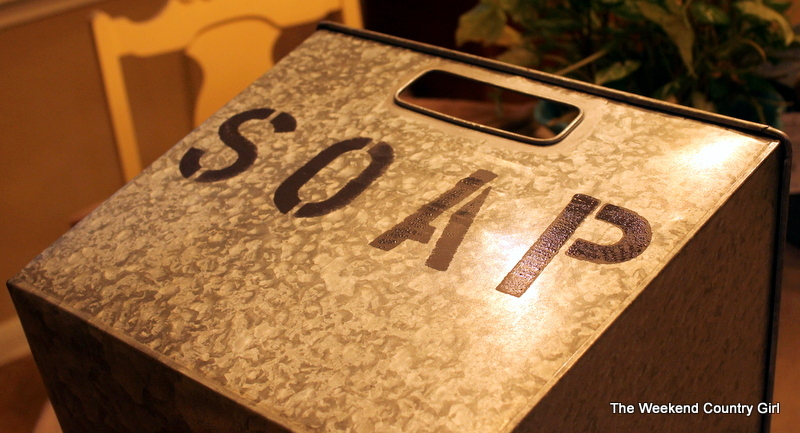 That being said, I adopted a more industrial look to the laundry room. I wanted to make sure that Hubby felt comfortable in our shared space. I don’t want to give anyone the idea that is MY laundry room! 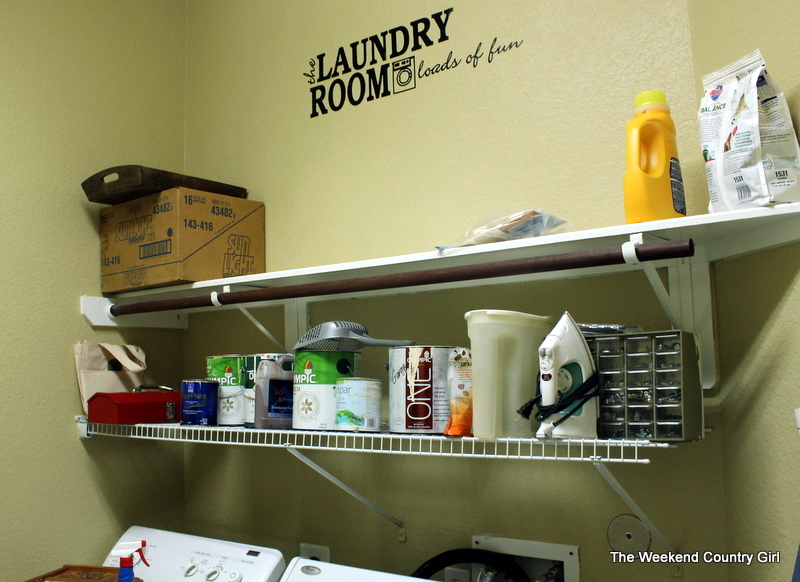 Also, our laundry room currently has open shelves. I will probably get cabinets put in because I like to keep some things in the house that others may keep in the garage. What can I say? I like to have a drill handy. 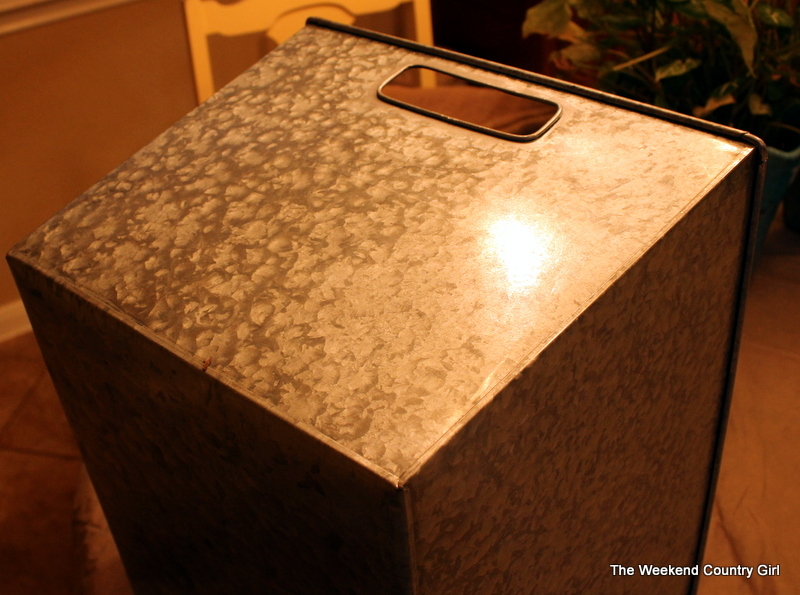 I found these great galvanized bins for about $10.00 each at Walmart. The smaller ones had cool rope handles too. 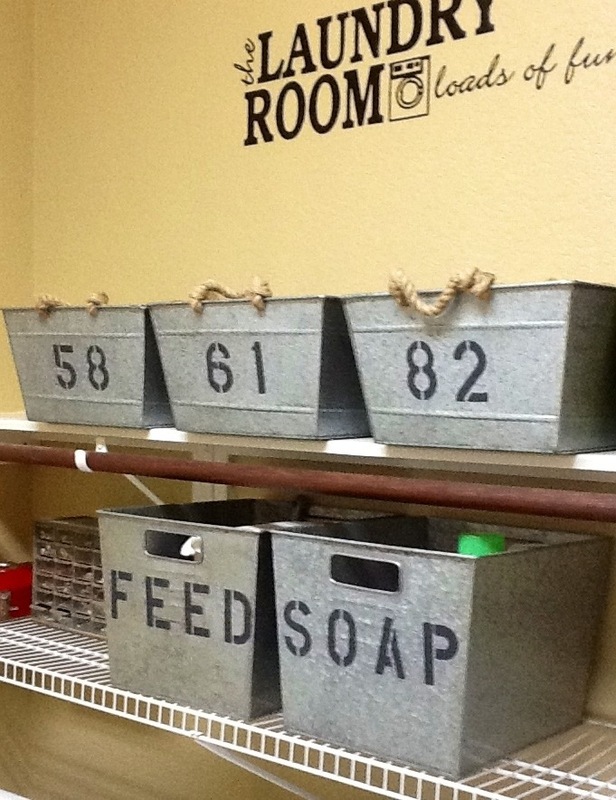 I decided to stencil the baskets, sort of like a locker room. 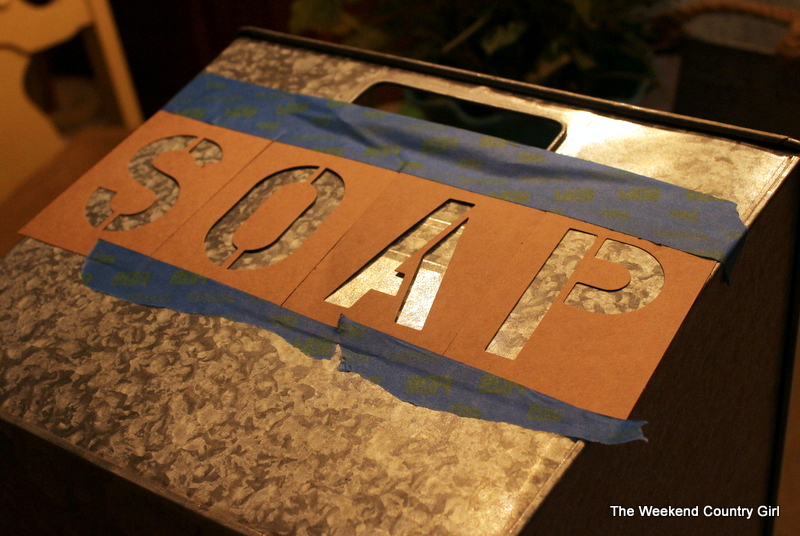 I purchased a cheap set of cardboard stencils in the art department at the same Walmart and a bottle of less than a dollar dark gray-black paint ( called pavement by Plaid). The larger bins will go on the lower shelf. 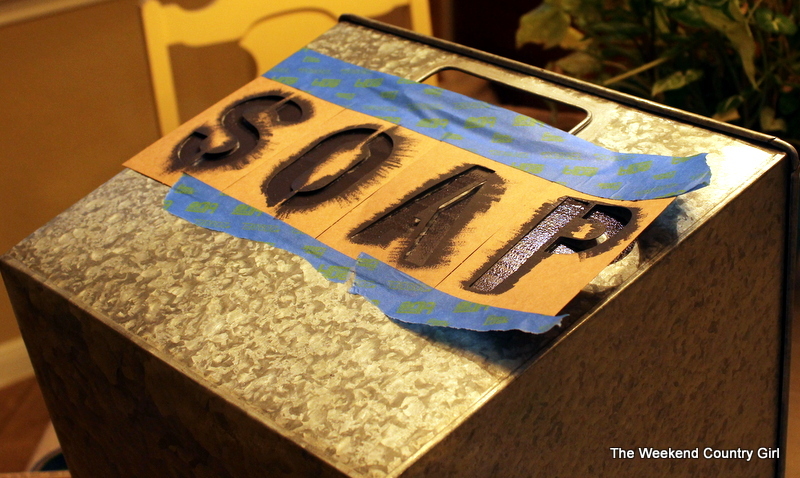 One says FEED and the other says…SOAP. Guess why? Hiding the detergent and pet food in plain sight. Love it. Here is the project under way. It seriously took me 30 minutes to get everything out, stencil the baskets, put everything up and get the baskets on the shelf. 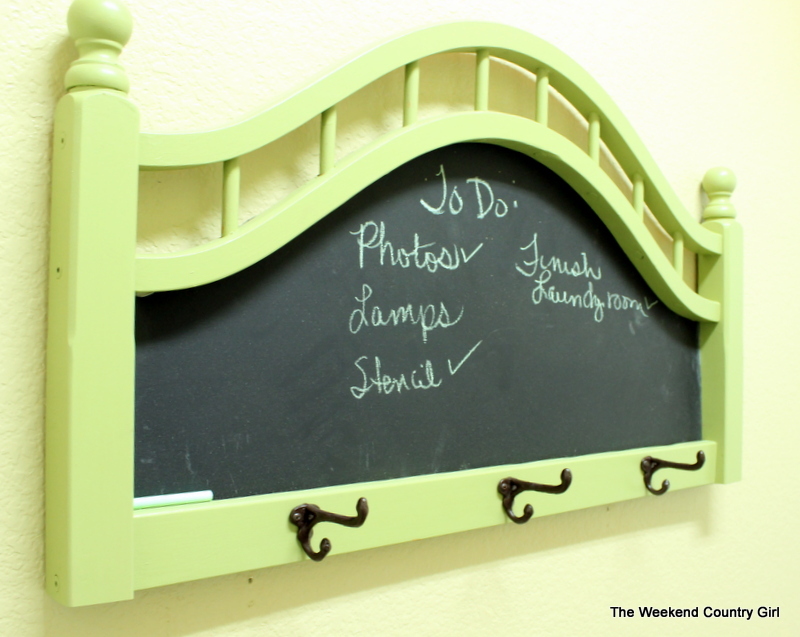 The addition of a glass wash board that belonged to my grandmother, a key cabinet made for us when we married by a family friend, the chalkboard that Hubby made from a roadside find headboard (it did not make it to the garage) and tadah! I feel like We made some serious progress here. I still want a functioning hanging bar and will be moving in a drying rack from the lake house, but we are almost there with this room. 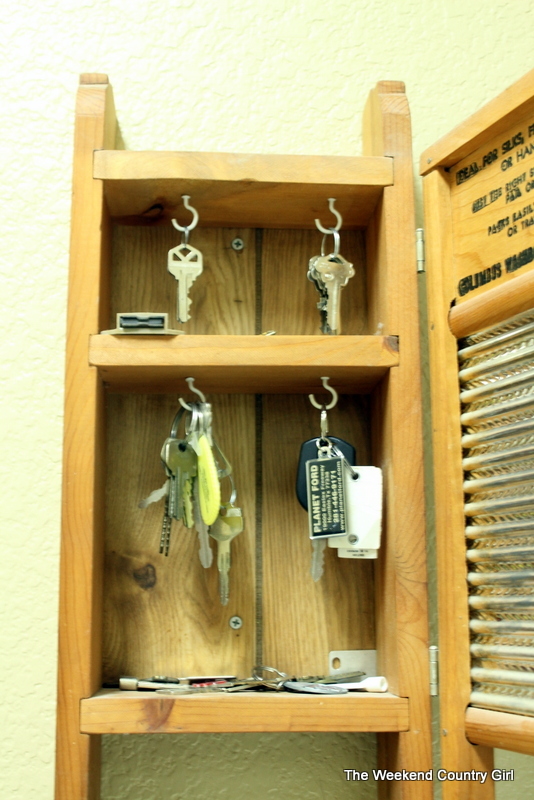 I love having the keys to all our random things in one location. This olive basket was also at Walmart and is going to serve as my trash can. 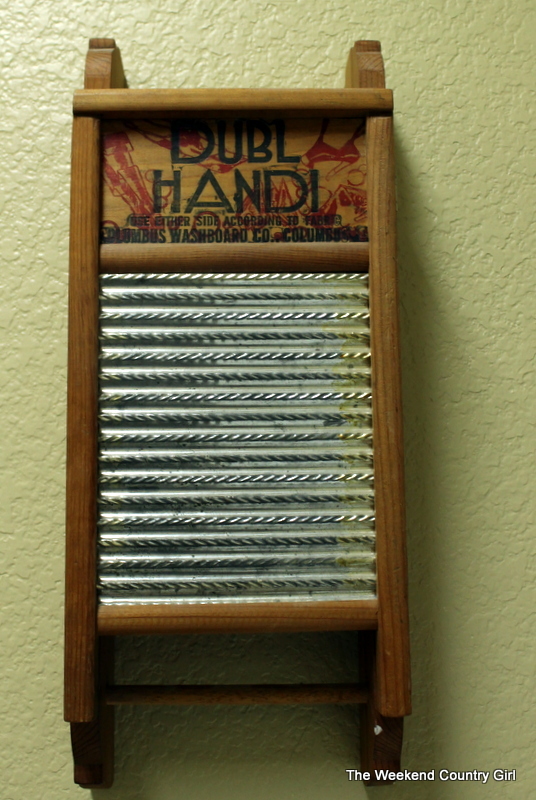 I love that the handles are going to hold trash sacks. Very nice! I’ve been seeing a lot of Laundry makeovers lately. This one look like it falls in my budget. Thanks for sharing! It falls into my tightwad budget too! Thanks for reading my blog. 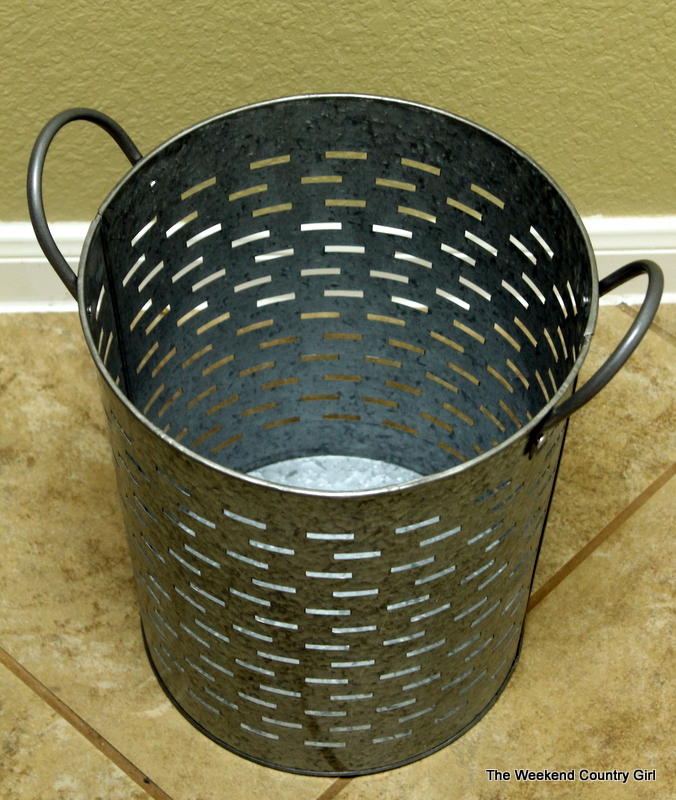 Oh, I love the handles on the trashcan. It’s such a pain when the bags fall in!